RGB + White 2700K-6500K Adjustable! A COLOR-CHANGING SYNC CONTROLLER IS REQUIRED AND NOT INCLUDED, SEE BELOW! EXCLUSIVE SUPERCHIP BRAND FROM C2CLIGHTS.COM! LIGHTING THAT DOES IT ALL! 30 Watt LED RGB + White (2700K-6500K) 120VAC Exclusive Superchip Color Changing LED Flood Light. Comes with an adjustable trunnion mount bracket for ez install almost anywhere. Please see our installation guide above for detailed installation instructions. These LED Syncable Color-Changing + White LED Flood Lights are as bright as 250-300 Watt quartz halogen lights or 100-120 Watt HID lights yet consumes at least 75% less power. Go green and save $$$. Go LED! 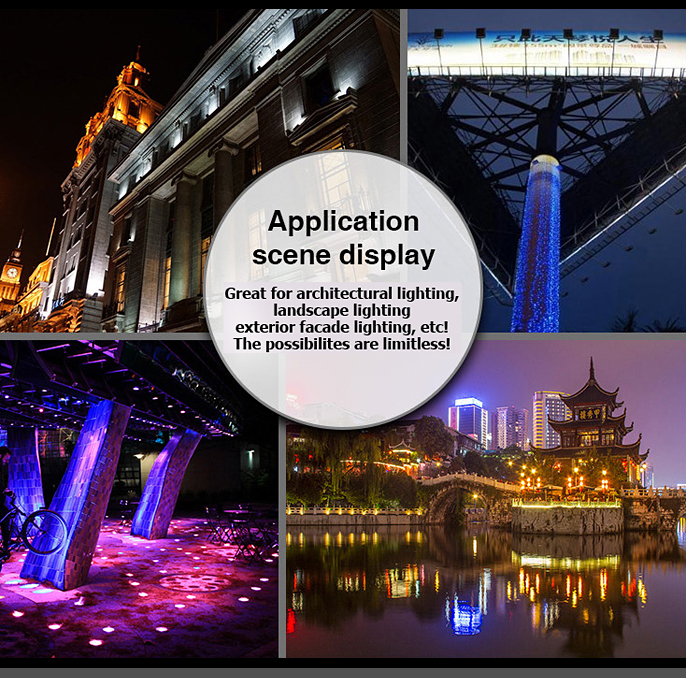 Syncronize an unlimited number of any style of our exclusive Superchip RGBW LED RF / Wifi LED Lights (as long as they are within range of the RGBW Controller), with up to four (4) separate zones! These can operate via a handheld 2.4GHz RF Remote Control or our advanced Wi-Fi Control Box. A controller is required and not included. See previous page or CLICK HERE to see / order a controller! INPUT VOLTAGE: Works on voltages ranging from 85VAC ~ 265 VAC Line Voltage. For other voltages, please call us! CONSTRUCTION: Heavy Duty Cast Aluminum construction Finished in Black with a Clear Lens. BEAM ANGLE: 160° Beam Angle ensures even output of light. LUMENS: 2,700 Lumens when in White light mode. Lumens will naturally vary depending on the color output you set these lights to. INSTALLATION: See our Installation / User Guide link above. MAX DISTANCE FROM CONTROLLER: 100 feet from the first light. If the next additional light is within 50-100 feet of the first light, the signal will jump from one light to another, making the range limitless! Range will lessen if there are objects such as walls, etc that impede the signal, similar to a cordless landline phone. Wifi Range, if used with our Wifi control box, will be completely dependent on your wifi system. WARRANTY: 2 year limited manufacturer's warranty.